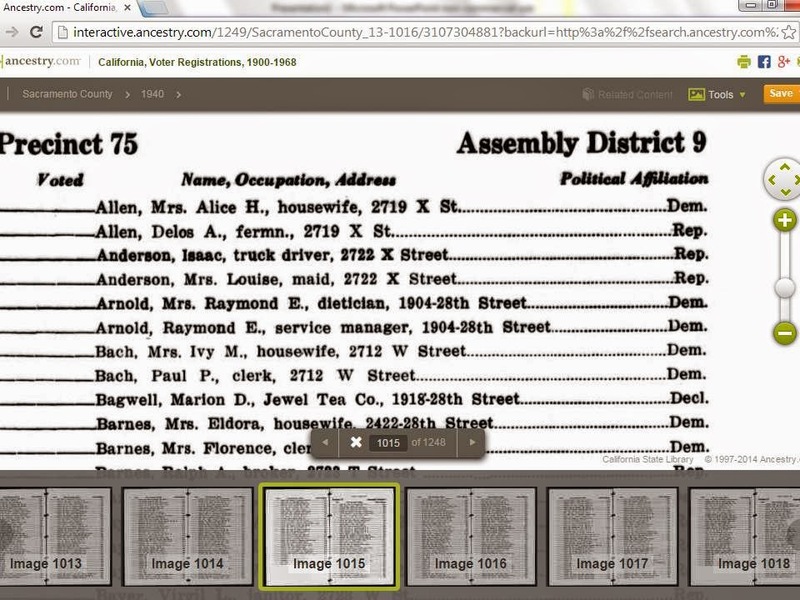 One of the new genealogy record collections on Ancestry.com is California Voter Registrations, 1900-1968. Since my family history includes California, this is an exciting new database for me to explore. I did a quick search to see if my mom, Jill Cimino would show up in the database. I was disappointed that I could not find her. 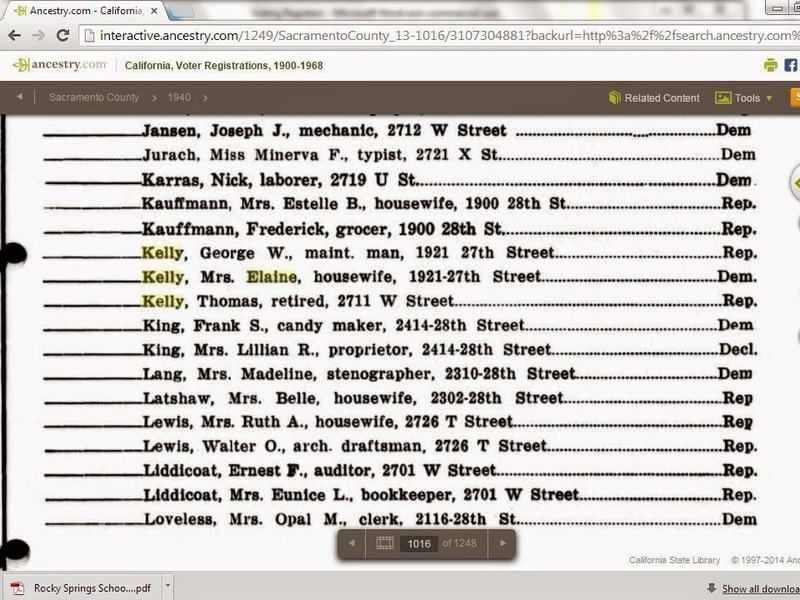 You can see here that Elaine Kelly is listed at the same address as her husband, George W. Kelly. They apparently had differing political views since Grandma was a Democrat and Grandpa was a Republican. 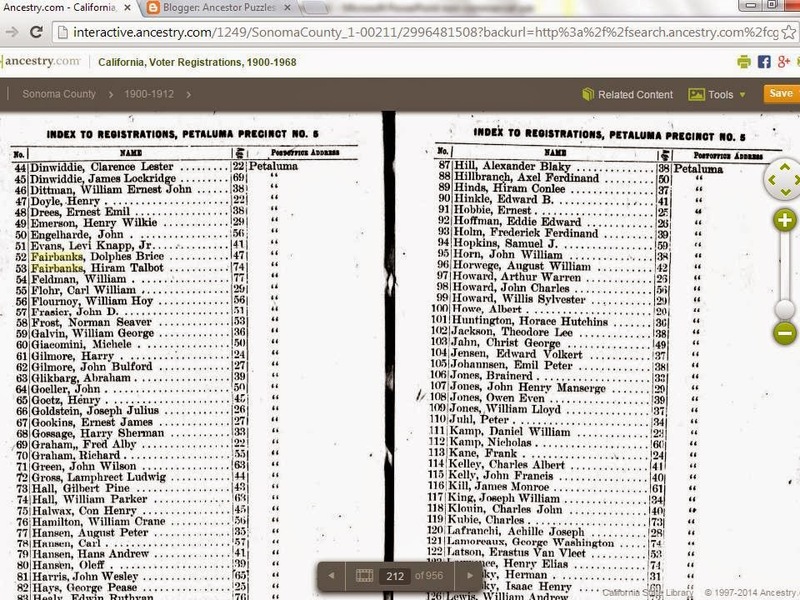 This listing of both husband and wife show how the Voting Registers are similar to a census record because all the registered voters in the household will be listed. One of the great new features on Ancestry.com is the ability to open up a filmstrip view of the record set. Most of the digital images that have been collected at Ancestry.com have originated from microfilm. The ability to scroll back and forth with the film strip view speeds up the process when you need to move around in the microfilm. In this case I wanted to page back to the beginning of the electoral precinct. The header shows the information that you can get from these voting registers including: Name, Occupation, Address and Political Affiliation. Here is the first page of the precinct which shows the precinct number and the Assembly District at the top of the page and the filmstrip view is shown at the bottom of the page. To show an example of a father and son listed together in a household, I searched for the surname Fairbanks in Sonoma County. I found Hiram Talbert Fairbanks, my 3rd great grand uncle listed in Petaluma Township. The image below shows that his son, Dolphes Brice Fairbanks was listed. These earlier registers give the full names, ages and post office address but not the street address. A scan of the other names in the precinct reveals that there were several relatives on the list. The Hill and the Higbee families were related to H.T. Fairbanks. One thing you might notice is that there are no women on this page. 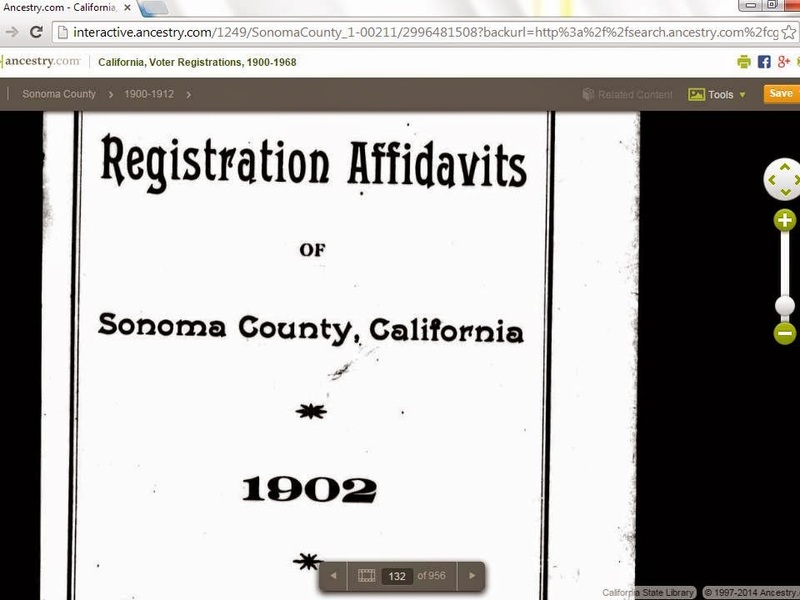 Women got the right to vote in California in 1911 so they start appearing in these registers in 1912. When you look at the image you will see that the registers from 1900 to 1912 are grouped together. I hope you have enjoyed this little primer in the use of the California Voter Register collection. Please contact me if you have any questions about your family history.